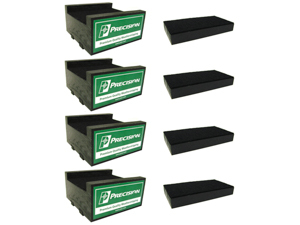 These blocks magnetically attach to your frame to protect it when aired out on your trailer. Rubber feet on the bottom prevent slippage while an upper felt coating protects your frame. These trailer blocks will accommodate frame rails of upto 3 inches wide. The set also includes 4 frame blocks and 4 small profile show blocks. Blocks should be removed before driving vehicle.